I think it is in sound’s nature to be free and uncontrollable and to go through the cracks and and to go places where it’s not supposed to go (Christian Marclay). The boundary between visual art and aural modes of creative practice is porous. Since the beginning of the twentieth century, artists, musicians, and writers have crossed over into one another’s domains in order to extend their field of competence, to collaborate on audio-visual works, to establish theoretical and methodological correlations, or to operate and cooperate in the interstice of their disciplines. Such endeavours have been isolated, sporadic, and for a limited period, but nonetheless significant. For example, the Italian Futurist painter Luigi Russolo’s manifesto L’Arte die rumori (The Art of Noises, 1913) informed the sensibilities of both musique concrete and electronic music. Around the same time, the Dadaist and father of conceptual art Marcel Duchamp wrote three pieces of music – including the instrument version of La Mariée mise à nu par ses célibataires même (The Bride Stripped Bare by her Bachelors Even) – in which he deployed chance procedures which anticipated John Cage’s aleatoric music 40 years later. Influence travelled in the opposite direction too. The Russian composer Alexander Scriabin conducted experiments in light-music that reflected a synthesis of, and an interest in the synaesthetic relationship between, vision and sound which preoccupied the painter Wassily Kandinsky too. Scriabin also created an electromechanical device called a clavier à lumières (colour organ), which informed the development, in the late twentieth century, of light organs and other devices to convert audio signals into coloured, rhythmic lighting effects. The alternating current between visual art and music on the one hand and sound-directed texts on the other has been equally energetic. In the Ursonate (1922–33), Duchamp’s contemporary, the painter and collagist Kurt Schwitters, adapted the sonata form as the structure for a phonetic sound poem, which he recited. His fellow Dadaists Tristan Zara and Francis Picabia made visual collages, and painted and composed visual poetry, respectively. For their part, musician-lyricists, along with poets who straddle the borderline of verse and song, have been a prominent feature in twentieth-century popular culture. Inasmuch as text can be presented in either a visual form (as the written word) or an aural form (as the spoken or sung word), or both, it occupies a unique position in sound-art studies. In fine art, one of the theoretical strictures that militated against the consistent and cohesive evolution of intermedial, visual-acoustic experimentation was late modernism’s self-critical tendency. This was a determination, according to the art critic Clement Greenberg, to ‘eliminate from the effects of each art and every effect that might be conceivably borrowed from or by the medium of any other art’ in order to narrow down each art’s sphere of competence, stake out its own territory, and define what is ‘unique and irreducible to itself’. However, the policy of austerity could not be enforced nor the magnetism of mediums resisted. Pop Art, conceptualism, happenings, installations, and in particular the activities of the neo-Dadaist movement Fluxus in the 1960s gave rise to works that elude categorization and to a variety of reciprocal inspirations between and across visual art, music, dance, and creative writing. For example, the visual artist Robert Rauschenberg was influenced by the work and writings of Cage who, in turn, applied the processes of random composition in his music to the production of visual art. Conceptualism restated Duchamp’s prioritization of idea over making, and his belief that the artist was free to engage in any medium. These convictions resulted in works such as Robert Morris’s seminal sculpture Box with the Sound of its Own Making (1961) in which ideation, process, and product, and visuality and (in Cage’s view) musicality are of a piece. Since the late 1970s, postmodernism’s emphasis on plurality, stylistic fusion, and the amalgamation of disparate material has further ruptured the membrane that separated mediums, styles, and art forms. Coalitions have been encouraged, within the wider cultural discourse, by the growth of interdisciplinary, intermedial, and transmedial studies (whereby different art forms and media are made and observed to combine, fuse, or productively co-relate), a renewed interest in the Wagnerian concept of Gesamtkunstwerk (total work of art), and ‘transgressive’ thinking (across the boundaries of subject fields). New conceptualizations of knowledge acquisition, which emphasize interaction and simultaneity of form and perception, have also helped to foster a climate conducive to the visual-audio research and practice. The convergence and crossover has been further enabled by the rise of new technology. Digitization has given visual artists, musicians and sound artists, and text-based creators a common language of 0s and 1s and the facility to seamlessly combine and manipulate different media as information which can be preserved, and accessed and shared via the Internet. In neuroscience, clinical psychology, psychiatry, and psychophysics, among other fields, multisensory research is now orientated to the ways in which we experience reality – cognitively, bodily, and spatially – in response to visual, audio, haptic, and olfactory cues and modes of perception, in both interaction and integration. As a consequence, the longstanding assumption that vision is a privileged or the dominant sensory modality (self-contained and independent of other senses) has come under question. Perception is conceived, rather, as transmodal, involving two or more different faculties simultaneously. 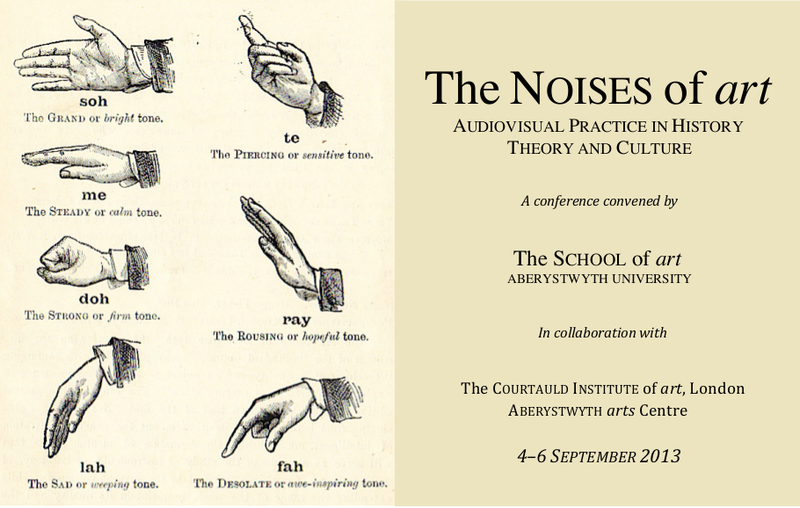 The challenge faced by practitioners of all the creative arts (and of the visual arts and art history especially) is to acknowledge the artificial separation of expressive modes and to articulate a sense of their connectedness not only through the unification and the study of (in this context) image, sound, and text, but also through the diversity and extension of the practitioner’s and historian’s spheres of competence.